There may be situations where you have a single master and want to replicate different databases to different slaves. For example, you may want to distribute different sales data to different departments to help spread the load during data analysis. 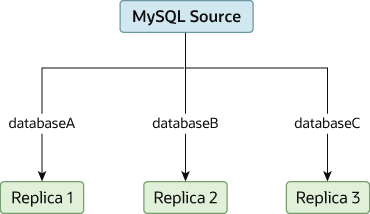 A sample of this layout is shown in Figure 17.2, “Using Replication to Replicate Databases to Separate Replication Slaves”.